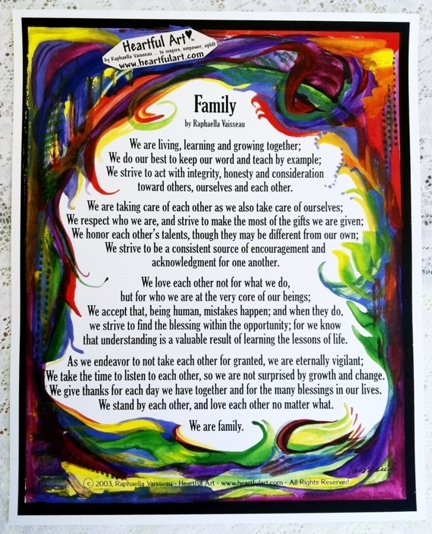 Raphaella Vaisseau's inspirational words on an 11" x 14" poster for Family. These original words comprise a family creed to live by, concepts to affirm, and truths to contemplate. It's a blessing and a study guide, with a workbook in progress and soon to be available. This original poem is also available in smaller sizes including a 5x7 poster, an 8-1/2x11 poster, and an 8x10 matted print. Love your family. Cherish each other.